Would you like to ditch the boring textbooks and use innovative curriculum based on the way students actually learn? Try Train up a Child Publishing’s literature-based curricula in your private or cottage school! How can I Use a Homeschooling Curriculum in a Private School? How would I use a literature-based curriculum in my classroom? I only have so much time for literature, science, history etc. ; how do I fit it all in? Will my students learn enough if we are spending time reading whole books? How do I fill in gaps of material not covered by whole books? Can my school afford the books needed for this curriculum? How will I evaluate my students? How will my parents respond to this curriculum? How do students using this curriculum do on standardized testing? The above are all very valid questions that teachers have asked us when we assist them in using our curriculum in their classrooms. Some of our authors, who had been teachers for many years prior to homeschooling, particularly understand the challenges faced when you want to incorporate the best curriculum but need it to work within a classroom environment. Your students to read and respond to great literature. You to integrate subject areas in order to teach more in a shorter period of time. For immersion into subject matter which leads to greater student engagement, stronger comprehension and a higher retention rate. For students to learn to think rather than simply read and regurgitate facts. You to create a room full of kids who love to read and love to learn. You read aloud to your students. 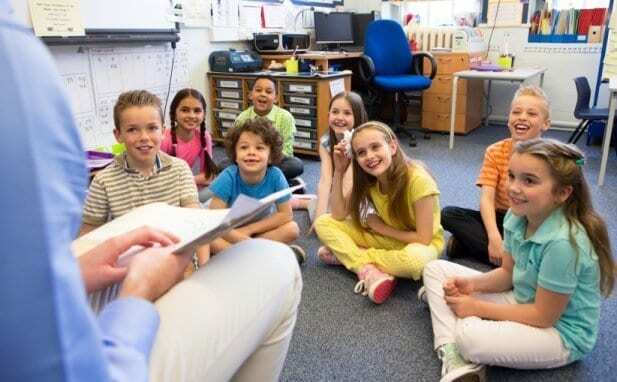 Older students ‘visit’ to read aloud to your students. Develop study groups and project groups. Have students orally narrate as they read. This can be singly, in pairs or in a group. Students working in pairs can design reports, reviews, etc., on various books and subjects. Assign each student a different mini–research topic to cover those that are not directly addressed in the whole books. Get parents involved by having parent/student teams work on reading books together and making presentations. What makes Train up a Child Publishing a superior curriculum choice? The emphasis on Biblical values, valuable literature, concrete science concepts, varied learning styles, strong writing skills, and fine arts is attractive and satisfying to teachers, administrators and parents alike. Students love the switch to whole books and varied activities, leaving uninteresting texts and evaluations readily behind them! For more information about using our curricula in the classroom, (as well as the answers to all the questions at the top of the page!) continue here. To find out more about using Train up a Child Unit Programs, Daily Lesson Plans and High School courses in your private or cottage school, including pricing information for one classroom or multi-classroom licensing, please contact us at dana@trainupachildpub.com. Please send your phone number if you would prefer to discuss your needs on the phone, along with times you are available to talk. We will confirm a phone appointment by email.